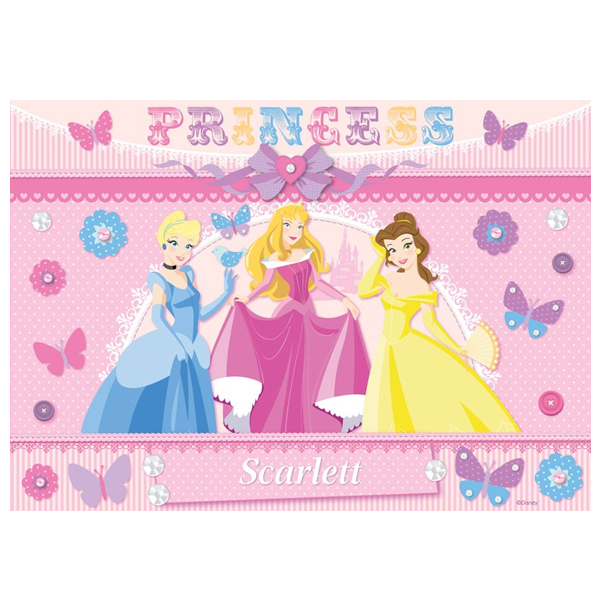 This set of 4 colourful high quality jigsaw puzzles show the Disney Princesses from the popular television series and is cut to a different piece count, so children can develop their puzzle making skills as they progress through the set. Puzzles are cut to 12, 16, 20 and 24 pieces and includes images of Cinderella, Rapunzel, Ariel, Tiana, Snow white, Belle, Merida, Aurora, Mulan and Jasmine. Finished puzzle size 19 x 14cm approximately. Puzzles are an excellent way to encourage your child\'s observation, imagination and communication skills. Ask questions about the picture or get your child to talk about the picture - for example ask them what they think is happening, or what some of the characters are saying. The Ravensburger Disney Princess 4 In A Box Puzzle is great for families with more than one child, or for a playgroup environment. Disney\'s Rapunzel is eager to seek adventure and discover her destiny both inside and outside the castle walls! The Swinging Locks Castle offers 2 sides of play in which kids can help the included Rapunzel doll slide down the zip line into her bedroom, swing in royal style, and move Pascal up and down the castle in a pale! Spin the sundial at the top of the tower to make the lanterns whirl! Play out Rapunzel\'s artsy and active adventures with an assortment of awesome accessories including a bed, brush, easel, paintbrush, paint palette, and lantern. Your little princess can live out her big dreams and favorite fairy tales in the Royal Dreams Castle! This enchanting playset is over 3 feet tall and features 4 furnished rooms of fun! Each room is themed around a Princess -- Snow White\'s kitchen, Belle\'s library and ballroom, Sleeping Beauty\'s bedroom, and Ariel\'s bathroom. Nineteen accessories – a bathtub, bed, bed canopy ring, soft canopy curtain, 5 kitchen utensils, kettle, pot, cup, stove, seat, Snow White\'s pie, plate with pie, shampoo bottle, soap, chandelier, and clock – make for seemingly endless fairy tale fun. There\'s even a magic carpet elevator ride for Jasmine – just lift the handle and then release to see the carpet glide down! Dolls sold separately. A shake of the magic wand brings the Disney Princess Magical Wand Palace to life with colourful lights. magical sounds. and fun phrases. This interactive playset recognizes all of your child\'s favourite Disney Princesses! Just place Disney Princesses Cinderella and Rapunzel on the magical spot to see the palace light up and to hear familiar phrases and magical sounds. Kids will love pressing the heart button on the magic wand to activate the lights and sounds. and going from room to room with the princesses to recreate some of their favourite moments from the Disney films. Go for a spin around the ballroom (oh. is that music I hear?). explore around the tea room. or discover a great book in the library. There\'s so much to do! Young Disney Princess fans will have a ball exploring all the fun and excitement in this interactive Little People playset! Rapunzel sings of her hopes for new discoveries and big adventures in Disney\'s Tangled the Series! Press Pascal on Rapunzel\'s shoulder and Musical Lights Rapunzel sings Wind in My Hair, her theme song from the series and will say 4 phrases! Pascal lights up in 3 colours as she sings and speaks! Brush her long, luxuriously beautiful hair too. Recreate memorable moments from Disney\'s Cinderella with Cinderella\'s Enchanted Vanity Set. The set features a vanity with drawers that open and close and a mirror that spins to reveal Cinderella! A chair, dress form, perfume bottle, comb, powder box, and pink dress for Cinderella are also included for endless enchanting fun! Doll sold separately. It\'s time for the royal ball, but how will Cinderella ever get there? With a turn of the top, this garden pumpkin becomes an elegant carriage fit for a princess! Your little dreamer will delight in making Cinderella\'s most magical movie moment come to life and then helping her hurry along to the ball in this enchanted transforming carriage. Don\'t forget to have her back before midnight! Elena of Avalor is the adventurous crown princess. Her sister, Isabel of Avalor, has an inventive and scientific mind that balances elena of avalor\'s impulsive nature, and helps the crown princess protect the kingdom of Avalor. With this sister 2-pack, girls can pretend to join elena of Avalor and Isabel of Avalor on water adventures in their enchanted kingdom. These beautiful fashion dolls come dressed in their TV series-inspired dresses, complete with fun, removable accessories – a book for Isabel of Avalor that opens and she can hold, a belt, hair clips, shoes, and earrings! Disney\'s Belle and the Beast share a romantic first dance with the Disney Princess Enchanted Ballroom Reveal set! Little dreamers can pretend to recreate the iconic dance scene from Beauty and the Beast, where the power of love transforms the Beast into the Prince. Belle is dressed in her signature, shimmery-gold gown, inspired by the one in the movie. Push the button near her heart to play the beloved song, Tale as Old as Time. Press the switch on the Beast figure\'s back to turn him from the gristly Beast to the enchanting Prince. Turn his head back to flip the figure\'s face to reveal the Beast again. Place the 2 dolls on the rose decorated doll stand and glide them across the table to watch them spin like they\'re dancing to the music. Now little kids with big dreams can take their playtime on the go! You and your little dreamer will love this beautiful castle that triples as a playset, carrying case, and a place to store dolls and accessories from the Little Kingdom line. (Cinderella doll included, other dolls sold separately.) With a magical nod to every Disney Princess, this castle is the perfect place for little ones to play out all of their favorite Disney stories! Little dreamers can keep the fun going by creating Cinderella\'s outfit and accessorizing her with the included Snap-ins. They can also decorate their Disney Princess with mix-and-match Snap-ins and outfits (additional Snap-ins and removable outfits are included with other Little Kingdom dolls, sold separately) and can build their own Little Kingdom! Play out life with Disney Princess Cinderella and Prince Charming in their castle with the LEGO Disney Princess Cinderellas Dream Castle 41154. Help them dine together in the grand dining hall before heading out to the revolving dancefloor on the balcony. Find the cheeky mice and feed them some cheese, then visit Cinderella\'s foal and help him practice over the jump or pull the cart. Enjoy building this set in different ways, moving and swapping the pieces inside and even rearranging the rooms of the castle-there\'s so much to explore and discover! Make a celebration to remember with Disney Princess Ariel and Eric. Set sail in their royal boat and pretend to play music with Sebastian by spinning the starfish while they dance the night away on the revolving dancefloor. Enjoy some cake with Max the dog and find Ariel\'s treasure hidden in the ship\'s hull, before launching Colourful fireworks from the back of the boat! Have fun building and rebuilding this set in different ways to create endless stories on the sea. Ursula is nowhere to be seen, so let\'s party with the LEGO Disney Princess Ariels Royal Celebration Boat 41153. 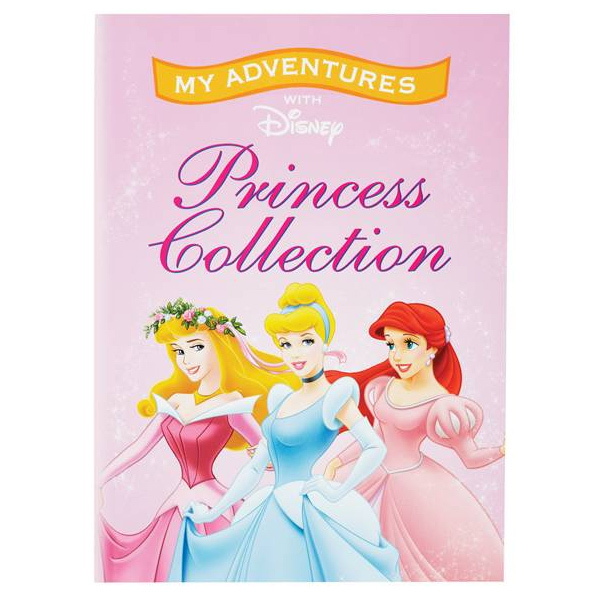 This magical collection of short stories is a follow on from the classic Disney Princess Collection. This personalised children's book makes a fantastic gift idea for a young girl who's in love with the magical world of Disney and adores the famous Disney Princess characters we all know. 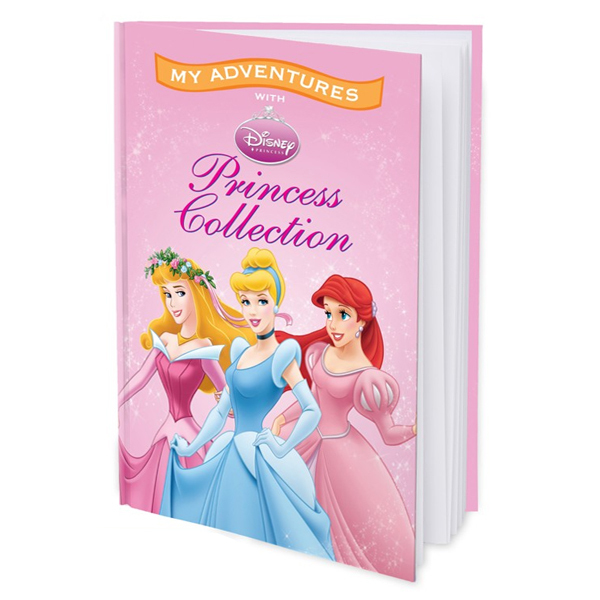 This Disney Princess Adventure Personalised Large Book is the 2nd in the series and is printed with your child's name and personal details throughout the story. It's a great gift idea for a child who loves princesses and all things pink on their birthday or at Christmas. Be the queen of creation by making your favourite Disney Princesses including Ariel, Belle, Rapunzel and Aurora with the Aqua Beads Disney Princess Playset. The set contains over 1,000 jewel and solid beads in 15 colours and also includes a pastel pink bead palette and a bead peeler. Just make and spray your designs - after only five minutes you can peel the creation away, pop it to the side and carry on creating! With colourful Aqua Beads, beautiful creations are simply a spray of water away! Rapunzel\'s magical golden hair take on a life of their own in Disney\'s Tangled the Series!Inspired by the action-packed animated series, this Disney Princess Tangled Spin \'n Style Rapunzel Doll brings hair-twisting action of her own. Squeeze the Rapunzel doll\'s dress and style her super long locks as she spins. Then complete her look with the included accessories; 6 hair plug-ins and 2 clips! Children can wrap Rapunzel\'s braid around the plug-in accessories to create fabulous hairdos. Wave a magic wand, connect the night time stars and dress up with Disney Princess characters Cinderella and Rapunzel to relive magical moments throughout their fairy tale kingdoms. Children use reading skills in active game play to transform objects in the enchanted garden, light lanterns to guide the way and collect jewels to complete a royal crown, just like a real princess. The LeapFrog LeapTV Disney Princess Software is perfect for children aged 4 to 7 years. Splash into Play-Doh creativity and re-create magical moments from Disney\'s The Little Mermaid movie! Ariel and Prince Eric are about to get married and everyone\'s invited to join the celebration. The unique castle piece features both King Trident and Eric\'s castle on the outside, and on the inside is a mould to create Ariel\'s wedding gown. Simply place Ariel and some Play-Doh compound in the mould, close it, then open it again to reveal a gorgeous gown. Decorate with the moulds and accessories, and even create Prince Eric with the stamper. Sebastian and Flounder are ready to join the fun reimagined as Play-Doh tools, and the can of Play-Doh Sparkle compound helps creations shimmer and shine. When the fun is done for the day, store everything on the coral reef base! The Magical Movers segment is all about doll-powered play! Kids can charge the doll and use her energy to activate exciting movements! Belle twirls the night away in the Dance \'n Twirl Ballroom. Charge Belle on the ballroom base, then put her on the ramp to see her twirl down the runway and gracefully spin around the dance floor. When you charge her, Cogsworth\'s hands tick! Place the charged doll on the balcony to see her friends, Mrs. Potts and Lumiere, spin along with her. Collect additional Magical Movers playsets for even more doll-powered fun. 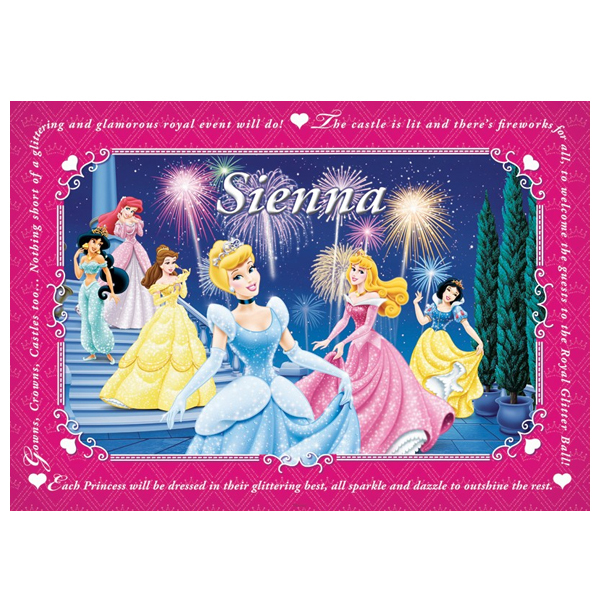 This personalised placemat is double sided and features 2 Disney Princess designs!. It measures 42cm x 29.5 cm (A3). It can be personalised with a maximum of 12 characters, making this a unique and special gift. Make meal time fun with this colourful personalised Disney Princess placemat. This beautiful placemat is double sided and can be personalised with a maximum 12 characters including spaces. Can you guess which perfumed Disney Princess card you\'re holding? Just scratch, sniff and discover! 2 in 1 card game, play the princess guessing game or princess matching game. Detailed rules included within the pack. 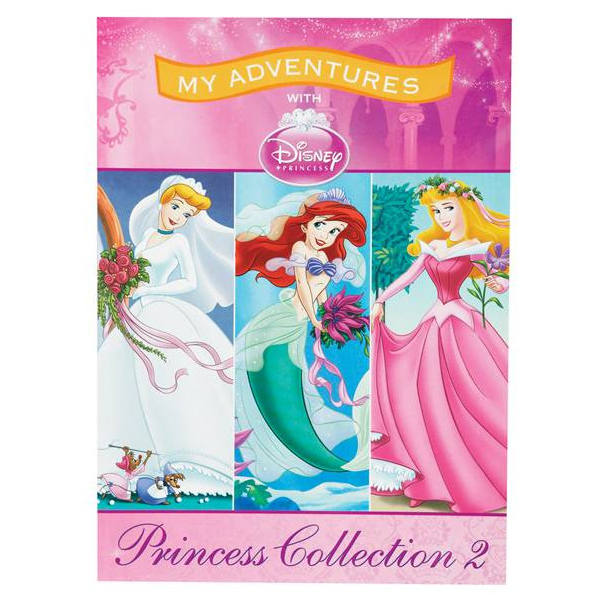 All little girls dream of princesses and castles and this delightful compilation of short stories - Cinderella, Sleeping Beauty and the Little Mermaid will definitely impress her, especially when she finds that she is the star in each of these wonderful Disney Princess adventures! Favourite Disney Princess characters are adorable playmates as little 15-inch toddler dolls! Disney Princess Belle My First Toddler Doll is dressed in her signature dress and features brushable hair, a poseable body and a glamorous tiara. Choose from Ariel, Aurora, Belle, Cinderella and Snow White. Favourite Disney Princess characters are adorable playmates as little 15-inch toddler dolls! Disney Princess Snow White My First Toddler Doll is dressed in her signature dress and features brushable hair, a poseable body and a glamorous tiara. Choose from Ariel, Aurora, Belle, Cinderella and Snow White. Elena of Avalor, the adventurous Crown Princess who wields her sceptre with bravery and compassion. Inspired by the Disney Channel TV series, this Disney Princess Elena Of Avalor Adventure Dress Doll encourages children to imagine joining Elena of Avalor on water adventures in the Kingdom of Avalor. This beautiful fashion doll comes dressed in Elena of Avalor\'s series-inspired adventure dress and includes a sceptre, hairclip, belt, pair of earrings, and removable shoes. It\'s a beautiful summer\'s day in Arendelle, but don\'t worry-Olaf has his own personal snow flurry to keep him cool! Join Elsa as she buys fresh vegetables from the stall and help Olaf smell the flowers. Head to the dock and have a picnic on the rowing boat. Then turn the clock face brick around to bring winter back to Arendelle, and slip on the skates for some fun on the ice! Enjoy building and customizing this set in different ways to create endless Frozen adventures with the LEGO Disney Princess Elsas Market Adventure 41155. It's time for the royal ball, but how will Cinderella ever get there? With a turn of the top, this garden pumpkin becomes an elegant carriage fit for a princess! Your little dreamer will delight in making Cinderella's most magical movie moment come to life and then helping her hurry along to the ball in this enchanted transforming carriage. Don't forget to have her back before midnight! Doll sold separately. The Princess and the Frog is one of the most iconic fairytales. Check out our amazing range of Disney Princess\'. 173cm tall. Please note: This is an assortment pack. 1 will be supplied and picked at random. Colours and decorations may vary.Magical Movers playsets bring exciting movement to your little dreamer\'s favourite Princess in a fun scene. Each playset is all about doll-powered play and offers a base that powers the Disney Princesses doll. Dolls not only move on their own (after being charged), they also activate other movements within the set. Discover a world of play when you place the doll on her base and pull the string to charge her. Then place her in the playset and send her on a magical adventure across a flat surface! Collect additional Magical Movers playsets for even more doll-powered fun. This Disney Princess Snow White Soft Doll is exquisitely made and completely soft so even the youngest fans can have their very own Disney princess! Snow White is wearing her signature blue and yellow with co coordinating headband and shoes. 10 inches tall. Inspired by the Classic Disney Princess, the Belle Styling Head will soon become your little one\'s favourite friend! Style Belle\'s glamorous hair up or down for a fairy-tale day or enchanted evening look. The hairstyling options are as endless as your imagination! Each set comes complete with styling head along with 13 hair accessories for wear and share fun! Use your creativity and the hair clips provided to give Belle a magical Disney makeover! Suitable for ages 3 and above. Contents: 1 styling head, 13 hair accessories. Exquisitely made and completely soft so even the youngest fans can have their very own princess!The Disney Princess Cute 10-Inch Rapunzel Soft Toy is wearing her signature pink gown with lace bodice and ruched sleeves. Rapunzel comes in a gift box and stands at 10 inches tall. Exquisitely made and completely soft so even the youngest fans can have their very own princess. The Disney Princess Cute 10-Inch Cinderella is wearing her signature blue gown with matching headband and gloves. 10 inches tall, also available in other sizes. Snow White was in the first animated feature film and has remained popular ever since. She brings happiness wherever she goes and has her own star on the Hollywood Walk of Fame. 168cm tall. Princess Jasmine is strong willed and beautiful. She has many adventures with Aladin and looks great decorating any room. Check out our amazing range of Disney Princess\'. 164cm tall. Ariel is Disney\'s Little Mermaid. She lives \'Under the Sea\' but now she can come onto land and brighten up your life. 166cm tall. Exquisitely made and completely soft so even the youngest fans can have their very own princess. The Disney Princess Cute 10-Inch Belle is wearing her signature yellow gown with matching gloves and shoes. 10 inches tall, also available in other sizes. Ariel is ready for shimmering adventures with your little one! Wearing her classic outfit with a new twist, Royal Shimmer Ariel dazzles in a signature-coloured jewel-ombre gown with glitter print detailing. Your little dreamer will love playing out magical moments from Disney\'s The Little Mermaid, as well as imagining her own under-the-sea fairy tale with Ariel. The Disney Princess Royal Shimmer Ariel Doll is suitable for children aged 3 years and over. This Rapunzel fashion doll is ready for shimmering adventures with your little one! Wearing her classic outfit with a new twist, Royal Shimmer Tangled dazzles in a signature-coloured, jewel-ombre gown with glitter print detailing. Your little dreamer will love playing out magical moments from Disney\'s Tangled, as well as imagining her own fairy tale.The Disney Princess Royal Shimmer Rapunzel Doll is suitable for children aged 3 years and over. Belle is ready for shimmering adventures with your little one! Wearing her classic outfit with a new twist, Royal Shimmer Belle dazzles in a signature-coloured, jewel-ombre gown with glitter print detailing. Your little dreamer will love playing out magical moments from Disney\'s Beauty and the Beast, as well as imagining her own fairy tale with Belle.The Disney Princess Royal Shimmer Belle Doll is suitable for children aged 3 years and over. Tiana is ready for shimmering adventures with your little one! Wearing her classic outfit with a new twist, Royal Shimmer Tiana dazzles in a signature-coloured, jewel-ombre gown with glitter print detailing. Your little dreamer will love playing out magical moments from Disney\'s The Princess and the Frog, as well as imagining her own fairy tale with Tiana.The Disney Princess Royal Shimmer Tiana Doll is suitable for children aged 4 years and over. This Disney Princess Belle pink lunch bag is the perfect gift for any occasion.Pink insulated lunch bag with full colour edge to edge full colour sublimated panel.Personalisation: 1 initial. This Disney Princess Cinderella pink lunch bag is the perfect gift for any occasion.Pink insulated lunch bag with full colour edge to edge full colour sublimated panel.Personalisation: 1 initial. This Disney Princess Snow White pink lunch bag is the perfect gift for any occasion.Pink insulated lunch bag with full colour edge to edge full colour sublimated panel.Personalisation: 1 initial. This Disney Princess Aurora pink lunch bag is the perfect gift for any occasion.Pink insulated lunch bag with full colour edge to edge full colour sublimated panel.Personalisation: 1 initial. Merida is ready for shimmering adventures with your little one! Wearing her classic outfit with a new twist, Royal Shimmer Merida dazzles in a signature-coloured, jewel-ombre gown with glitter print detailing. Your little dreamer will love playing out magical moments from Disney/Pixar\'s Brave, as well as imagining her own fairy tale with Merida.The Disney Princess Royal Shimmer Merida Doll is suitable for children aged 3 years and over. Exquisitely made and completely soft so even the youngest fans can have their very own princess. The Disney Princess Cute 10-Inch Ariel is wearing her turquoise princess gown with matching shoes. The Disney Princess Cute 10-Inch Ariel is 10 inches tall, also available in other sizes. These 4 foam puzzles featuring Ariel and her friends, can be used in the bath and will stick to the bath sides.Includes 1 x 2 piece, 2 x 3 piece, 1 x 4 piece puzzles.The Disney Princess Ariel Bath Puzzles are perfect for Disney Princess fans, ages 3 years and over.Please note: Rinse and dry puzzles after use. Please note: This is an assortment pack. 1 will be supplied and picked at random. Colours and decorations may vary.The Disney Princess Little Kingdom Water Play Assortment comes with either Ariel or Rapunzel, and their Floating Dreams boats! Both boats float in water and come with an oar and a wave-shaped base.Ariel\'s boat also comes with a pretend seaweed tether and a seahorse and fish Snap-ins.Rapunzel\'s boat comes with a hairstyle tether and Pascal, he can snap onto her boat.Each doll is 3 inches tall and can sit or stand. In its first collaboration with magical Disney, Tangle Teezer has treated its multi-award-winning detangling hairbrush, The Original, to a special edition glittery pink colour and a set of Disney princess stickers to customise your hairbrush with. The very first creation by Tangle Teezer inventor Shaun P, The Original banishes tangles, knots and helps prevent hair breakage. This is all possible thanks to its unique two-tiered system technology - the long teeth detangle and the short teeth smooth the hair cuticle for healthier-looking, glossy hair. Designed to glide through wet or dry hair of all types and textures with ease and speed, it\'s the perfect hairbrush for little princesses who dream of soft, shiny, tangle-free hair. This Disney Princess Rapunzel pink lunch bag is the perfect gift for any occasion.Pink insulated lunch bag with full colour edge to edge full colour sublimated panel.Personalisation: 1 initial. Make a children’s party extra special with this Disney Princess ultimate party kit.Suitable for up to 16 children.Set includes:• 16x plates• 16x cups• 20x napkins• 1x table cover• 12x candles• 18x party / loot bags• 16x balloons• 1x bannerDesigns may vary slightly. The Disney Princess Disney Beauty & The Beast Sketchbook includes over 100 stickers & stencils and an extensive design guide. 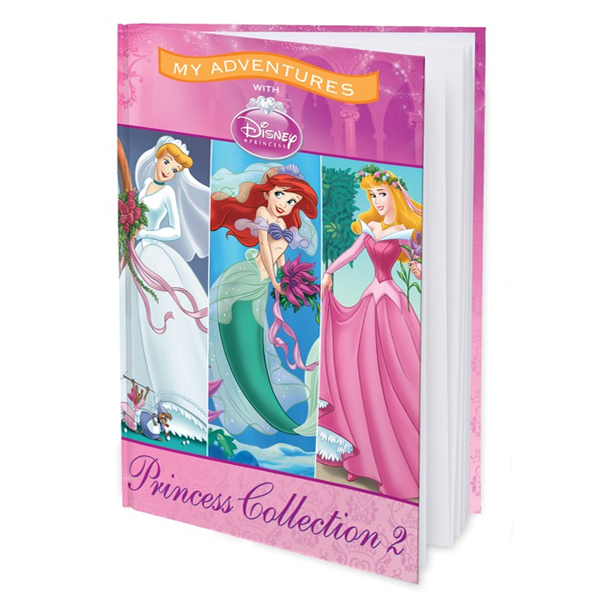 This Beautiful activity book is perfect for Disney Princess fans aged 8 years and over. The Disney Princess Ariel Watercolour Activity Book includes 4 watercolour paints, 3 watercolour pencils and an extensive design guide. This Beautiful activity book is perfect for Disney Princess fans aged 8 years and over. This set of four Disney Princess puzzles shows Cinderella, Aurora, Belle and Rapunzel; each wearing a beautiful colourful dress!Each puzzle has been carefully designed to ensure plenty of colour, detail and visual clues, to help little ones develop their jigsaw building skills. The Ravensburger Disney Princess 4 Shaped Puzzles is great for use in a family environment or a playgroup as the set can be used with mixed abilities or age groups.Each puzzle (10, 12, 14 and 16 pieces) measures approximately 35x25cm when complete and is made from strong premium grade cardboard, with linen finish print to minimise glare on puzzle image.Suitable for ages 3 years and over. Please note: This is an assortment pack. 1 will be supplied and picked at random. Colours and decorations may vary.Children can recreate magical moments from their favourite Disney movies with the enchanted Disney Princess Little Kingdom Doll & Accessory Assortment, featuring Ariel, Rapunzel, or Belle (one supplied).Ariel\'s Treasure Chest comes with Ariel and her jewellery box, which opens to reveal Flounder.Rapunzel\'s Styling Salon comes with Rapunzel and her favourite friend, Pascal, who can sit in the styling chair. Snap the included blonde wig into Pascal\'s head for a silly look.Belle\'s Teacart Treats comes with Belle, Mrs. Potts and a teacart with teacup, pie, and sugar bowl Snap-ins pieces.Your little dreamer can keep the fun going by creating outfits for the dolls and accessorising them with the included Snap-ins pieces or mix-and-match Snap-ins pieces and outfits with other Little Kingdom Playsets and Accessories (sold separately). This beautiful illustration of the Disney Princesses at Christmas is a fantastic puzzle to piece together. Not only is the image so beautiful, but its magical too as glitter has been added to give the puzzle that extra special, Christmas feel. Featuring Rapunzel, Belle, Aurora, Cinderella, Snow White and Ariel in Christmas spirits in this magical Ravensburger Disney Princess Glitter Christmas XXL 100 Piece Jigsaw Puzzle.High quality 100 piece cardboard jigsaw puzzle with Extra Extra Large pieces. The finished puzzle measures 49 x 36 cm when complete. Suitable for ages 6 years and up. Made from strong premium grade cardboard, with linen finish print to minimise glare on puzzle image.At Ravensburger we have over 50 years of puzzle-making experience and pride ourselves on having the highest quality Jigsaw Puzzles around. All Ravensburger puzzles are crafted using Softclick Technology and watchmaker precision to ensure the greatest possible accuracy and variety of each puzzle piece. Make a children’s party extra special with this Disney Moana ultimate party kit.Suitable for up to 16 children.Set includes:• 16x plates• 16x cups• 20x napkins• 1x table cover• 12x candles• 18x party / loot bags• 16x balloons• 1x bannerDesigns may vary slightly. Please note: This is an assortment pack. 1 will be supplied and picked at random. Colours and decorations may vary. Have amazing water fun with these Disney Princess Water Play Dolls. Which Disney princess will you get? Please note: This is an assortment pack. 1 will be supplied and picked at random. Colours and decorations may vary.The Magical Movers segment brings exciting movement to your little dreamer\'s favourite Disney Princesses. These doll-powered sets feature a base that powers the doll: Put doll on the base and pull the string to charge her. Place doll on a hard, flat surface to see her twirl and twirl! Your little dreamer will love playing out magical muments from Disney Princess adventures, as well as imagining her own royal journeys. Collect additional Magical Movers dolls and playsets for even more doll-powered fun. Beautiful 12' bike with bright bold colours, pretty Princess graphics and ribbon tassels.Features:• 30cm (12") puncture proof tyres• Removable stabilisers• Fully enclosed printed chain guard• Front and rear caliper brakes• Adjustable handlebar height 61-63cm• Adjustable seat height 41-46cm• Ribbon tassels• Colourful shaped character plaqueAge: 3+ years. Features:• Resolution: 800 x 480• Built-in Parental controls function• 2 built-in stereo speakers• Wide 7in (17.78cm) LCD screen• 1 x CR2025 Battery Included• USB 2.0 port to play music from any external audio peripheral. Perfect for playing music from your MP3 player or smartphone!Accessories included:• 1 AC adaptor• 1 car adaptor• 1 remote control• 1 pair of headphones and rechargeable battery with approximately 2.5 hours of battery lifeCompatible with DVD, DVDR, DVDRW, VCD and MPEG-4 formats (XVID, MP4 and AVI only). This amazing 3 in 1 set is perfect for fans of Disney Princess who love beads and creating. There is a fabulour hair beader, simply string on your chosen beads, hook the hair and then push the beader lever to clasp them into place. Your favorite disney princesses as they were when they were toddlers! choose from: aurora, cinderella, belle, tiana, snow white or ariel. each 13 inch princess doll is dressed in their signature costumes and feature beautiful rooted hair, a poseable body and a tiara. Expand your little one’s imagination with bright, colourful hard-to-find wallpapers. Transform bedrooms and playrooms into coral reefs, enchanted fairytale castles or into a sky full of superheroes, where your child can escape with their favourite characters.nDIMENSIONS:nHeight: 254cm (8'4'') Width: 368cm (12'1'')nSUPPLIED IN 8 PANELS nEach photo wallpaper is made up of poster sized panels that fit together perfectly to create your photo wallpaper..nINSTALLATIONnPaste the back of the paper. Allow to soak for the recommended time and then apply to the wall. Full instruction included with each item. Progressive tricycle for kids from 15m to 3 years old +. Metal frame, safety belt, adjustable and removable parental handle.Free wheel disposal at the front, to prevent the pedals from turning when the parent is pushing the trike.Handlebar locking device, to prevent the kid to interfere in the steering when parent is pushing the trike. Ergonomic seat, adjustable on 2 positions. Antiskid pedals. Translucent and spangled rear basket. Features:• Press the PROJECT button to project the time on the ceiling!• Listen to 4 amazing Princess sound effects by pressing on Cinderella's figurine• Press the base to switch on a cosy night light that lasts for up to 15 minutes• FM radio• Digital time display on the LCD screen• AlarmPower supply: 4 LR6/AA batteries (not included). Disney Princess 1 litre hot water bottle is an absolute must for any Disney Princess fan. The front of the cover is made from a high quality cotton sateen that features Ariel, Cinderella and Rapunzel. Dimensions: H28cm x W17cm x D5cm. This personalised Disney Princess Cinderella Rocks medium wash bag makes the perfect treat for yourself or gift for any occasion. We merge your personalisation with this stylish design to create a fantastic practical present to make the recipient smile.Personalisation:Name: up to 10 characters. Pack of 2 character cake stands. Disney Princess 100ml Eau De Toilette and Lunch Box Gift Set. A perfect big vanity studio for little ones! You can sit on the stool at the table and play with the comb, lipstick, perfume bottle, brushes and a hairdryer, or try on the rings and bracelet (included) to turn yourself into a real life Princess! Includes 17 accessories including comb, rings and make-up. Assembled dimensions: H75.8 x W48.4 x D19.6cm (29¾ x 19 x 7¾"). For children 3 years and over. Make a secret den or hideaway. Beautiful Princess wigwam with sturdy poles and tie back doors.Features:• Built dimensions 100 x 100 x 160cm• 190T polyester material• PVC poles with fabric cover• Closed top• Beautiful Princess graphics• Integrated floor• Tie back front flapsAge: 3+ years. Make a secret den or hideaway. Tropical Moana wigwam with sturdy poles and tie back doors.Features:• Built dimensions 100 x 100 x 160cm• 190T polyester material• PVC poles with fabric cover• Closed top• Tropical Moana graphics• Integrated floor• Tie back front flapsAge: 3+ years. An elegant Disney Princess folding in-line scooter with anti-slip footplate and rear brake. Perfect for days out with it's easy to use fold away system. The scooter is decorated with Disney Princess character favourites, and has a colour printed anti-slip footplate. The scooter has a rear footbrake, adjustable handlebar height and a pretty printed stem wrap. Age 5+ years. This adorable officially licensed Disney Princess - Forever Magic duvet set features Cinderella, Rapunzel and Sleeping Beauty. The perfect addition for your little princesses bedroom. Includes one single duvet cover and one pillowcase. Duvet cover size 137cm x 198cm and pillowcase size 50cm x 75cm. 60% cotton/ 40% polyester. Machine washable and can be tumble dried. Disney's Elena of Aval or must learn to be there for her family, her friends, and her kingdom -- all while growing up, going on adventures, and discovering her inner powers. Inspired by the Disney channel animated TV series, this doll line encourages girls to imagine joining Elena of Aval or on magical adventures in the kingdom of Aval or. This beautiful fashion doll comes dressed in Elena of aviator's series-inspired adventure outfit and includes a poncho, belt, purse, lasso, pair of boots, and pair of earrings. Copyright Disney Hasbro and all related terms are trademarks of Hasbro. Electronic reader and 8 book library. Reads all 8 books aloud. For children 18 months and over. Intelligent and compassionate, Belle finds a way to help the Beast. Wearing her classic outfit with a new twist, Royal Shimmer Belle dazzles in a signature-coloured, jewel Ombre gown with glitter detail. Your little dreamer will love playing out magical moments from Disney's Beauty and the Beast, as well as imagining her own fairy tale with Belle. Doll has movie-inspired features. Size H29cm. This product is suitable for ages 3 years and over. "n"Safety Warning"n""n"Please read the product description and specifications carefully. Make a children’s party extra special with this wonderful Disney Sofia The First ultimate party kit. Suitable for up to 16 children. Set includes: • 16x plates • 16x cups • 20x napkins • 1x table cover • 12x candles • 16x party / loot bags • 16x balloons • 1x banner Designs may vary slightly. Enchanting tri-scooter perfect for any aspiring Princess. Sturdy three wheel scooter gives extra stability for beginners. Decorated with Disney Princess character favourites and beautifully shaped Princess plaque and bespoke shaped deck.Features:• Colour printed anti-slip footplate• Bespoke shaped deck• 15cm (6") front wheel with puncture proof tyre• 12cm (5") rear wheels with puncture proof tyres• Adjustable handlebar height 63-69cm• Beautiful character plaque and graphics Age: 3+ years. This personalised Disney Princess Belle initial cushion with a hollow fiber inner, smooth linen and double sided edge to edge full colour print with invisible zip. A great gift for any occasion that is superb quality and excellent value. Size 45cm x 45cm.Personalisation: 1 initial. This personalised Disney Princess Cinderella initial cushion with a hollow fiber inner, smooth linen and double sided edge to edge full colour print with invisible zip. A great gift for any occasion that is superb quality and excellent value. Size 45cm x 45cm.Personalisation: 1 initial. This personalised Disney Princess Snow White initial cushion with a hollow fiber inner, smooth linen and double sided edge to edge full colour print with invisible zip. A great gift for any occasion that is superb quality and excellent value. Size 45cm x 45cm.Personalisation: 1 initial. This personalised Disney Princess Aurora initial cushion with a hollow fiber inner, smooth linen and double sided edge to edge full colour print with invisible zip. A great gift for any occasion that is superb quality and excellent value. Size 45cm x 45cm.Personalisation: 1 initial. This stunning jigsaw puzzle features colourful artwork featuring your favourite Disney Princess Belle, from the film Beauty and the Beast. Suitable for anyone who prefer puzzles with large pieces. High quality 100 piece cardboard jigsaw puzzle with Extra Extra Large pieces. The finished puzzle measures 49 x 36 cm when complete. Suitable for ages 6 years and up. Made from strong premium grade cardboard, with linen finish print to minimise glare on puzzle image. For those creative fans of Disney Princess, here is something new to try. Your very own Cinderella Clay Wardrobe including moulds for her clothes and a mannequin to dress. The wardrobe has miniature hangers and can be decorated in your own style. 60g putty packed in shaped plastic moulds, 8 pieces of putty packed with blister packed in the colourbox with PVC window with holographic. This personalised Disney Princess Rapunzel initial cushion with a hollow fibre inner, smooth linen and double sided edge to edge full colour print with invisible zip. A great gift for any ocassion that is superb quality and excellent value. Size 45cm x 45cm.Personalisation: 1 initial. Design beautiful art with our Disney Princess Creative Art Set. Your little one will feel like a magical princess when they're drawing, creating and using their imagination. This set is a must-have for kids who can't get enough of the wonderful world of Disney! Every child loves to dress up which makes this Disney Princess Mosaic Value Set the perfect gift. Your child can have hours of fun using the stickers and gems to give a unique design to their gift, then hours of imaginative fun prending to be their favorite princess on another adventure!! This truly stunning gift is sure to raise a smile as the recipient sees their personalisation on the Disney Princess Belle initial mug. This Disney Princess Belle initial mug makes an ideal gift for any occasion.Personalisation: 1 initial. Disney's Elena of Aval or uses her magical sceptre to protect Aval or and rule with fairness and grace. When girls wave Elena's arm while holding the sceptre, a variety of lights and sounds are activated, bringing the enchantment of the Disney channel animated TV series to her world! pretending to rule like the crown princess is empowering and fun! the doll comes dressed in her red adventure dress with a belt, pair of earrings, and pair of shoes. Copyright Disney Hasbro and all related terms are trademarks of Hasbro.Safety WarningAges 3 and up Warning: Choking hazard- Small parts. Not for children under 3 years. Requires 3X 1.5V A76 alkaline batteries (demo batteries included) Doll does not stand on its own. A beautiful Disney Princess pink strap watch with a silver case featuring a time teacher function. The dial features Disney Princesses with pink numbers and hands. An ideal first watch for children learning to tell the time.Includes a one year guarantee and a Disney Princess themed backing card. Pretty Princess safety helmet, ideal for biking, skating and scootering. Decorated with Disney Princess character favourites, perfect for any aspiring Princess.Features:• Adjustable size dial• Foam padding for extra comfort and fit• Quick-release buckle• Adjustable head straps• Lightweight EPS inner• Ventilated shellTo fit head size: 48-54cm. Features:• A pair of enchanting walkie-talkies to keep in touch in style with your friends• A great handy design especially made for little hands• Transmission range: up to 300 feet/100m outdoors• A beautiful image of lovely Disney princesses for its fans• Belt clip: clip your walkie-talkie on your belt and get ready for amazing adventures• Flexible antennaPower supply: 2 x 6F22 9Volt (not included). Let your fairytale begin with these 77 Disney Princess room stickers. All your dreams can really come true. Simply peel and stick! Your room has never looked so good!With these removable and repositionable stickers, you can transform any bedroom, nursery or playroom in minutes. These room stickers can be applied to any smooth surface, including walls, doors and furniture! Each wall sticker pack contains 3 large sticker sheets, each sheet measures 34 cm x 46 cm (13.4" x 18.1"). This Disney Princess Create and Craft set is ideal for a little artists needs to create drawings and paintings. Easy to draw and doodle and sketch with and is the perfect way to encourage creativity, imagination and hand coordination. It will also keep your little ones busily entertained for hours on end. Assorted beads, glow in the dark beads, beads organizer, stickers, elastic chord, hair beader, comb, instruction paper. This personalised Disney Princess Belle initial A5 notebook is perfect for home, school, university or the office.Personalisation: 1 initial. This personalised Disney Princess Cinderella initial A5 notebook is perfect for home, school, university or the office.Personalisation: 1 initial. This Princess projection station comes with its very own sketch book, slides and projector! Pop in your slides and project the image on to your book and draw, colour and fill in the image! Great for hours of fun with the little ones, let your inner artist come out and create some amazing Princess drawings. Can you match 5 in a row? Top Trumps Match has loads of cubes and loads of characters. Can you make a row of 5 matching images and will you get the character you need? Can you take the match with the Special Top Trumps cards? Push out a cube! Match a row! But…Can you take the match? Banish boring bedtimes with this 3-In-1 magic night light, torch and projector. Place the character on the base and watch them magically illuminate the night light, making it change colours and project a scene on the wall. When you lift them off the base, they transform into a character torch for bedtime reading. Uses 4xAAA batteries. For children 2 years and over. Keep yourself hydrated in style with your own personalised. This fashionable and robust – the perfect gift for any occasion, or a practical treat for yourself. 100% aluminium, so you know that they are tough and can withstand being banged around in your bag. Personalisation: 1 initial. This personalised Disney Princess Snow White initial A5 notebook is perfect for home, school, university or the office.Personalisation: 1 initial. This personalised Disney Princess Aurora initial A5 notebook is perfect for home, school, university or the office.Personalisation: 1 initial. This personalised Disney Princess Rapunzel initial A5 notebook is perfect for home, school, university or the office.Personalisation: 1 initial. Keep yourself hydrated in style with your own personalised Disney Princess Cinderella initial water bottle. Cinderella initial water bottle, this Cinderella initial water bottle is fashionable and robust – the perfect gift for any occasion, or a practical treat for yourself.Personalisation: 1 initial. Keep yourself hydrated in style with your own personalised Disney Princess Snow White initial water bottle. Snow White initial water bottle, this Snow White initial water bottle is fashionable and robust – the perfect gift for any occasion, or a practical treat for yourself.Personalisation: 1 initial. Keep yourself hydrated in style with your own personalised Disney Princess Aurora initial water bottle. Aurora initial water bottle, this Aurora initial water bottle is fashionable and robust – the perfect gift for any occasion, or a practical treat for yourself.Personalisation: 1 initial. Keep yourself hydrated in style with your own personalised Disney Princess Rapunzel initial water bottle. Rapunzel initial water bottle, this Rapunzel initial water bottle is fashionable and robust – the perfect gift for any occasion, or a practical treat for yourself.Personalisation: 1 initial. This truly stunning gift is sure to raise a smile as the recipient sees their personalisation on the Disney Princess Cinderella initial mug. This Disney Princess Cinderella initial mug makes an ideal gift for any occasion. Dishwasher and microwave safe.Personalisation: 1 initial. This truly stunning gift is sure to raise a smile as the recipient sees their personalisation on the Disney Princess Snow White initial mug. This Disney Princess Snow White initial mug makes an ideal gift for any occasion. Dishwasher and microwave safe.Personalisation: 1 initial. This Neck Support Pillow is ideal for keeping your child comfortable on long car journeys. Available in a stylish Disney Princess print your child will love while giving them the support they need. Your favourite character themed backpack, that is perfect for transporting your child's school essentials such as snacks, books, lunches, stationery and homework. Personalisation (on top of backpack): name up to 11 letters. With matching umbrella. Create your own glitter domes, featuring your favourite princess with a choice of Cinderella, Rapunzel and Ariel. This triple pack includes:• 3 x Domes• 6 x Paints• 1 x Pot of glitter• 1 x Paint brush. For children 3 years and over. This truly stunning gift is sure to raise a smile as the recipient sees their personalisation on the Disney Princess Aurora initial mug. This Disney Princess Aurora initial mug makes an ideal gift for any occasion. Dishwasher and microwave safe.Personalisation: 1 initial. This truly stunning gift is sure to raise a smile as the recipient sees their personalisation on the Disney Princess Rapunzel initial mug. This Disney Princess Rapunzel initial mug makes an ideal gift for any occasion. Dishwasher and microwave safe.Personalisation: 1 initial. Let Down Your Hair! Colour & Style Little Girl Hair Collection! Pamper and transform your hair into a beautiful Princess style with this Let down your hair set. With Hair extensions, Hair mist, Hair Chalk and the finishing bit of any look the tiara! Not forgetting..all of our make up is designed for the young at heart and safe for use by all users aged 3 years and over. For many 2009\'s, The Princess and the Frog led directly to the path that later spawned Tangled and Frozen. The film is full of great characters and now they are getting the POP! treatment. We love the evil Dr. Facilier, cuteness of Louis, but our total favourite has to be Tiana in her ball gown and Naveen in frog form. Great! Each POP! vinyl figure stands around 9 cm tall. Disney Princess magnetic scribbler provides hours of fun with no mess with your childs favourite disney film character graphics. Simply use the pen on the magnetic drawing board to trace lines and any shapes you like. This is ideal for keeping the kids occupied on long journeys and also a great way to encourage creativity. Make beautiful trinkets fit for a Disney Princess with this Fabulous Jewellery Creations Set. It's the easy and fun way to create jewellery with a Disney twist.Simply follow the instructions and use the gems, stickers and other accessories for fab bracelets to wear and share with friends. This 6 pack of Disney Princess puzzle erasers make a lovely addition to any stationery set. Contains Belle, Aurora, Ariel, Cinderella, Rapunzel and Snow White. Design your own bead jewellery, use the assorted beads, stickers and elastic cord to design your jewellery! Includes Disney Princess jewellery box. A single zipped compartment back pack with twin straps and an image of Cinderella, Belle and Snow White on the front. Personalisation: name up to 11 letters. 100% cotton. Your favourite character themed gym bag, that is perfect for transporting your child's PE kit essentials such as pumps and gym kits. Complete with water bottle. Personalisation: name up to 11 letters on the towel. Have amazing arty fun with this gorgeous plush toy, with a stunning image of your favourite Disney Princess, Belle for you to colour. Enjoy colouring the plush princess in with the pens included and once you are finished wash it and you are ready to colour again. • Plush measures: 25cm approx. Have amazing arty fun with this gorgeous plush toy, with a stunning image of your favourite Disney Princess, Rapunzel for you to colour. A twin handled small PVC tote bag with an image of Belle, Cinderella, Snow White and Aurora. This high back booster seat is suitable from 9 months to 11/12 years approx. (9kg/20lbs to 36kg/79lbs. It has a height adjustable head support with side impact protection. The 5 point harness is tightened with individual tensionners for added safety. It has a quick release buckle and chest and buckle pads for comfort. The cover is removable and hand washable. FEATURES: Suitable for Groups 1 & 3. From 9 - 36 kgs (around 9 months - 11 years.) Fixes in the car with the use of the 3 point seat belt of the car. Lightweight, easy to carry and fits in most cars. Generous side guidance for optimized side impact protection Luxury padded seat and armrests. Height adjustable head support grows with the child Padded head support Versatile - as your child grows, the back removes to leave a booster seat. 5 point safety harness with one pull adjustment. Safety harness can be removed at the 15kg stage to make a high back booster seat. Complete with seat belt adjuster strap to keep the shoulder belt away from the neck Converts into a booster seat. DIMENSIONS: Size: 45. 5cm x 27cm x 69. 7cm Weight: 5. Little dreamers can play out their favourite fairy tales in a castle filled with music and dancing! the whimsical musical moments castle features 6 rooms, each inspired by a different princess character. Place the included Rapunzel or Belle doll on the dance floor and move the dial back and forth to play music and make her dance. Dolls can swing in the Teacup and pretend to snack on treats in snow White\'s kitchen. The castle has a frying pan elevator, taking dolls from floor to floor, and girls can turn the clock\'s hands too. Store the dolls\' included stylish snap-ins pieces inside the castle. Keep the fun going by creating and accessorizing Rapunzel and Belle\'s outfits with the included snap-ins pieces. They can also mix and match snap-ins pieces and outfits from other sets (additional snap-ins and removable outfits are included with other little kingdom dolls and playsets, sold separately) and can build their own little kingdom! Disney Princess~Royal Style Belle Doll~3 Dresses~Girls Giftset Ages 3-8~HTF~NIB! Ever wondered how many Disney Princesses there are in total? The answer is eleven. And whilst each princess is different in their own unique way, they all share positive values of compassion, determination, strength and bravery. These character traits are easily found in each of the princesses\' stories, which have now been amalgamated into this beautifully made hardback book. This unique gift recounts every Disney Princess film in chronological order. From the generous and kindly Snow White, to the courageous Merida in Brave, your favourite Disney Princess will never be further than a page turn away. Each story is full of hope, and a little magic to inspire the next generation. These strong female characters are proof that princesses should always dream BIG. To add to the magic of this wonderful collection of storie, your loved one\'s name can be added to the header of each page, as well as adding their name and a personal message to the opening page. Shimmering dreams await with the Royal Sparkle Collection, which features 5 of Disney\'s beloved Princesses adorned in glittering gowns! Cinderella, Tiana, Snow White, Belle, and Ariel all come with a bodice, peplum, and skirt. Your little dreamer can keep the fun going by creating the dolls\' outfits and accessorizing them with the included Snap-ins. They can also decorate their Disney Princesses with mix-and-match Snap-ins and outfits (sold separately) and can build their own Little Kingdom! Inspired by the classic Disney princess, the Deluxe Belle styling head will soon become your little one\'s favourite friend! Style Belle\'s glamorous hair up or down for a fairy-tale day or enchanted evening look. Use the hair styling donut accessory included to recreate Belle\'s signature bun and secure it with the iconic rose hair clip. You could also add some colour with the beauty and the beast themed hair extensions. The hairstyling options are as endless as your imagination! you can even wear the accessories yourself! Comes with 12 beauty and the beast themed accessories to wear and share! use your creativity and the hair accessories provided to give Belle an enchanted Disney makeover! This Deluxe styling head also has colour-changing nails, lips and eye shadow to transform her look from day to evening! Give this Disney princess the best look ever! great for budding hair dressers aged three and up. Suitable for ages 3 and above. Be creative and dream big by painting water scenes with Disney\'s Rapunzel! fill up the included water bowl with tap water and grab the oversized paint brush! then, slide the canvas into the easel and begin painting with water! by brushing Rapunzel’s canvas with water, little dreamers can reveal unforgettable movie moments. After time, when the canvas dries, the images will disappear so girls can paint with water again and again. The Rapunzel water reveal canvas doll comes wearing a beautiful, movie-inspired dress and paint-spattered frock. Little princesses can imagine magical moments from Disney\'s The Little Mermaid with the princess of the waves! This Splash Surprise Ariel doll is ready to transform from mermaid to girl. Just place her in the water and her fin fills up with water. Then, lift her out of the water and see her fin break apart to reveal her legs! The Splash Surprise Ariel doll comes with 1 fin and 1 skirt for fun both under the sea and above the waves. Little dreamers can have oceans of fun seeing Ariel\'s transformation! Girls can draw fun shapes with Disney\'s dancing doodles Belle! attach Belle\'s marker to her and use the 2 included wheels to create fun designs on paper. Little princesses can make lots of masterpieces with the flowing shapes! the Belle doll also features beautiful up-do-styled hair and is dressed in her signature colour, just like in the movie beauty and the beast.